We are in midst of a technology & innovation-driven era where a whole range of high-tech gadgetry impact our lives every single day. Not only in our personal lives, but it has affected the world of manufacturing, sales & services in a big manner. Every day, we hear about a new technological breakthrough and how will it impact us overall. The 4th industrial revolution and Industry 4.0 is the most talked about topic these days. While it is good to know about these innovations and its impact, it is also important to realize that organizations that have surplus capital in hand can afford to implement new technologies and reap the benefits out of it. The ground reality is much different and the backbone of US economy i.e. Manufacturing struggles to move ahead, adapt to rapid changes and economically sustain themselves. We might want to ask. In this era of rapid technological innovations and progress, what challenges do SME manufacturers face today? Are they capable to tackle these challenges alone? What assistance do they need? How will they adapt to growing changes and keep up to speed? Let’s play with some trivia. 75% of these firms have less than 20 employees in their unit. That makes them small-scale in terms of number of employees. The entire manufacturing industry in US employs almost 12.4 million people generating an output (Nominal GDP) of $2.2 Trillion as on Q3 2016. In the 1960s, 1 in 4 American worked for a manufacturing company. This has drastically reduced to 1 in 10. Since 2000, 5 million manufacturing jobs have been lost. The focus is more on other industry segments such as hospitality, pharma etc. Despite this, manufacturing segment holds 12% of total US economy, followed by agriculture that holds almost 5%. US is still the world’s second largest manufacturing hub after China and if it has to get to the top slot, it has to make some drastic measures. 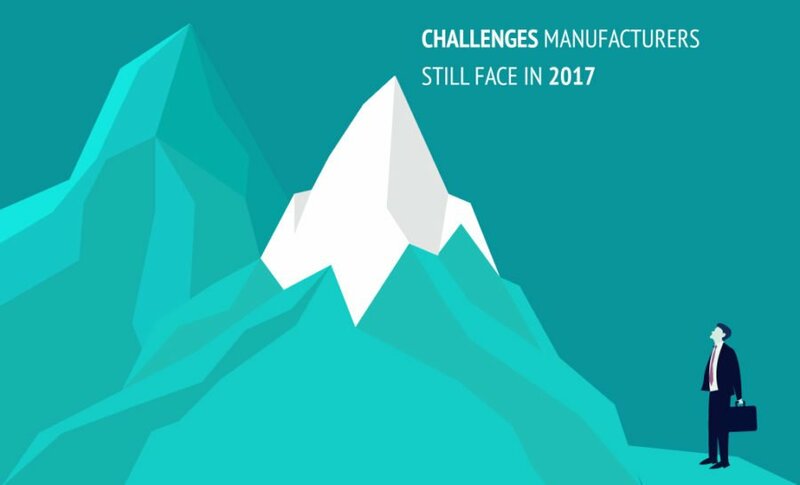 Let us take a look at the challenges that still exist for SME manufacturers. One of the biggest challenges US manufacturers face is market sustenance. Operational and production costs have increased drastically. The pressure to manufacture products and deliver it within tight deadlines takes a toll on manufacturers. One slip and the manufacturer’s reputation and trust goes for a toss making prospective customers/orders difficult to come by. Also, growing operational costs have risen owing to providing health-care insurance and personnel benefits to each employee in the unit, state taxes, bad lending decisions, logistics, employee hiring/training etc. With production being stagnant, it becomes really difficult to deal with increasing costs unless manufacturers innovate and implement smart manufacturing and financial practices. Apart from this, competition has increased both from within and outside US. Therefore, it becomes vital on the manufacturer’s end to think out of the box and attract potential businesses and customers to collaborate with them. Another huge concern is finding and retaining labor that are not only skilled but have good work ethics too. Every manufacturer hopes to have a good workforce that follows professionalism, work ethics, and be loyal to the organization. Manufacturers spend a lot of time hiring labor and train them only to see them go and repeat the same cycle again. With no clear policy of reducing attrition, this clearly burns a hole in the manufacturer’s pocket. The survival of a product depends on its utility to users. As technology progresses, product demands also change be it in a B2B or a B2C environment. The onus clearly lies on manufacturers to innovate and come up with new solutions to problems that are long-existent and not solved by anybody else. Innovation also means finding scope for improving existing products and including new technology so that it adds more value to the lives of its users. But with continuous focus on acquiring new customers, focus on planned and ad-hoc orders, managing production and labor, innovation takes a back seat. Many manufacturers go with the flow and do not really focus on planning for the year ahead. A good business plan not only provides a solid goal for the organization to follow, but also gives a sense of purpose and accountability to everyone working in it. It helps manufacturers to realize how much orders they need to get in a year, how much products they need to manufacture, and how much growth they need to pursue in a year. By this, each department knows their individual goals to pursue and work towards it. One of the biggest challenges for an SME manufacturer is to upgrade existing manufacturing technology. Most SME manufacturers rely on standard manufacturing technology and workflow processes to manufacture products. Advanced Manufacturing Execution Systems (MES) and Machine Monitoring technology helps manufacturers to drastically reduce production time, keep track on each production process, efficiently manage inventory & supply chain, reduce machine downtime and increase profitability for the organization. However, a technological upgrade requires sufficient capital which becomes quite difficult for manufacturers to come up with. Most manufacturers aren’t aware of what technology can do to their business and adoption delay leads to anticipated losses. Manufacturers collect data but are clueless of what to do with it. Data collected during production is a treasure trove of information that can help predict sales numbers, determine OEE, increase machine and labor productivity, improve inventory and supply chain management and much more. Manufacturers need to invest in analytical solutions that will help decipher this data and provide valuable insights about their day to day operations and overall business health. This will help them improve business and manufacturing practices thereby aiding in continuous growth. Manufacturers struggle to comply with tough industry & environmental standards. Compliance laws are constantly updated, and manufacturers are expected to follow suit. This involves enhancing products that involve changing manufacturing techniques, business processes, labor training, adopting new economic & taxation standards etc. Proper consultations to understand these regulations helps them to adopt it quickly and avoid high penalty, damaged reputation and loss of potential customers. When manufacturers adopt technology in their business, they also stand the risk of being hit with cyberattacks. A cyberattack has the potential to cease production and shut down the facility, target machines and be the cause of an unfortunate mishap at the production floor, steal precious customer data, proprietary information, product blueprints, financial information etc. Without proper IT security frameworks and infrastructure in place, a manufacturer cannot prevent such attacks and is liable to lose market reputation and customers. Read our previous blog, Cyber Security and why is it critical for manufacturers? The manufacturing world is passing through a rapid transformation. It will need some smart thinking and tough decision making on the part of manufacturers to undertake critical workflow changes, staying abreast of technological innovation and adopt suitable ones in their organization. With the right technology, right people, and effective implementation, manufacturers can easily sail through these challenges, stay ahead of the competition and tread the growth path.